///A being that is in full cooperation with all selves may sometimes reach consensus regarding which universe is most meaningful. 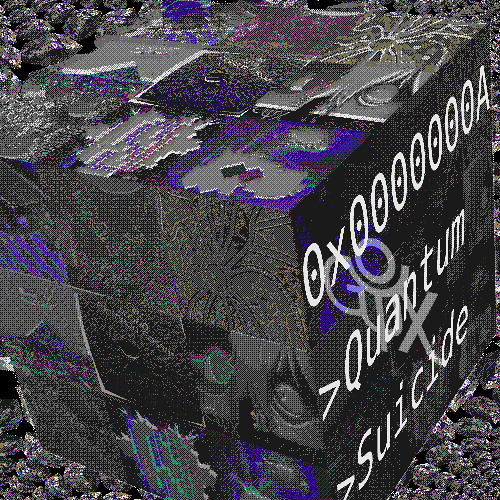 When that coincides with the universe in which that being endures the greatest suffering, it may happen that the others decide to send their complete support to that individual in the form of quantum suicide, culling all branches to one. Excellent work as always! Your works never cease to surprise me with how enjoyable and intriguing they are to listen to. Thank you so much for your support, Merveilles. I couldn't have gotten to week 10 without yas. [quote=xavoneir]Excellent work as always! Your works never cease to surprise me with how enjoyable and intriguing they are to listen to. [/quote] [quote=cblgh]nice textures and wow these pads... a sonic buffet, gpsych. ah, what a beautiful and complete track - it might be one of my favs of yours so far. good job :)[/quote]Thank you so much for your support, Merveilles. I couldn't have gotten to week 10 without yas. what a lovely build - nice piece! - gave me lots of feels! [img]https://media.giphy.com/media/3oz8xP4C2Hf3KEdRzq/giphy.gif[/img] what a lovely build - nice piece! - gave me lots of feels!